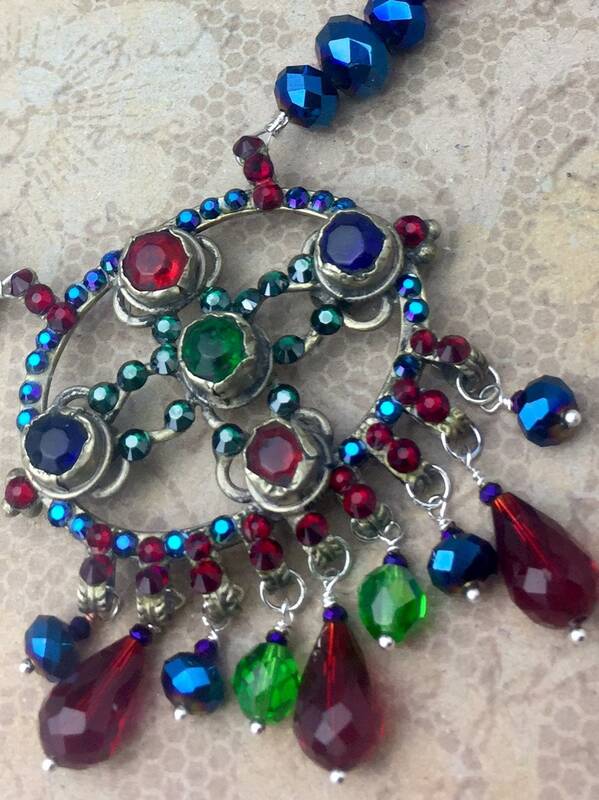 One Of A Kind Vintage Kuchi and Jewel Tones! 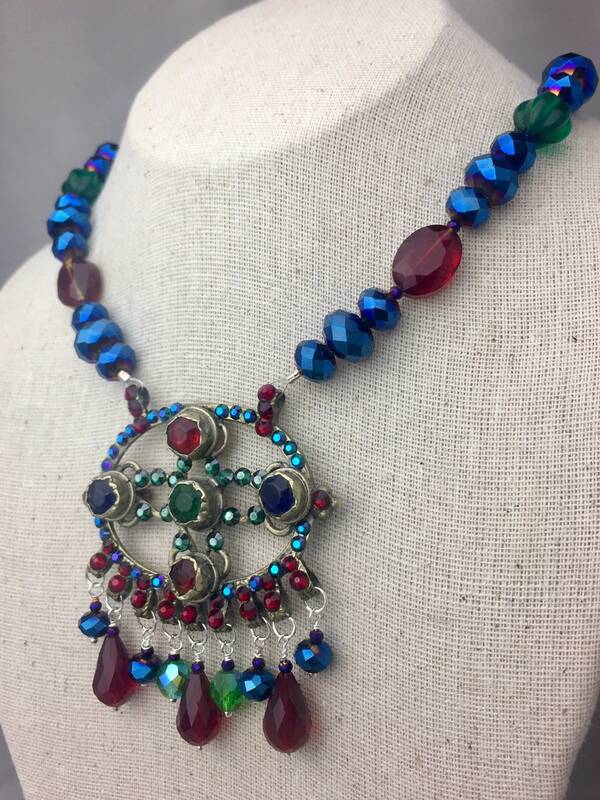 This necklace has a brass base with the original rustic red, green, and blue glass gems surrounded with new Swarovski Crystal in siam, blue, and green and then fringed with glass beads in red, green, and blue. 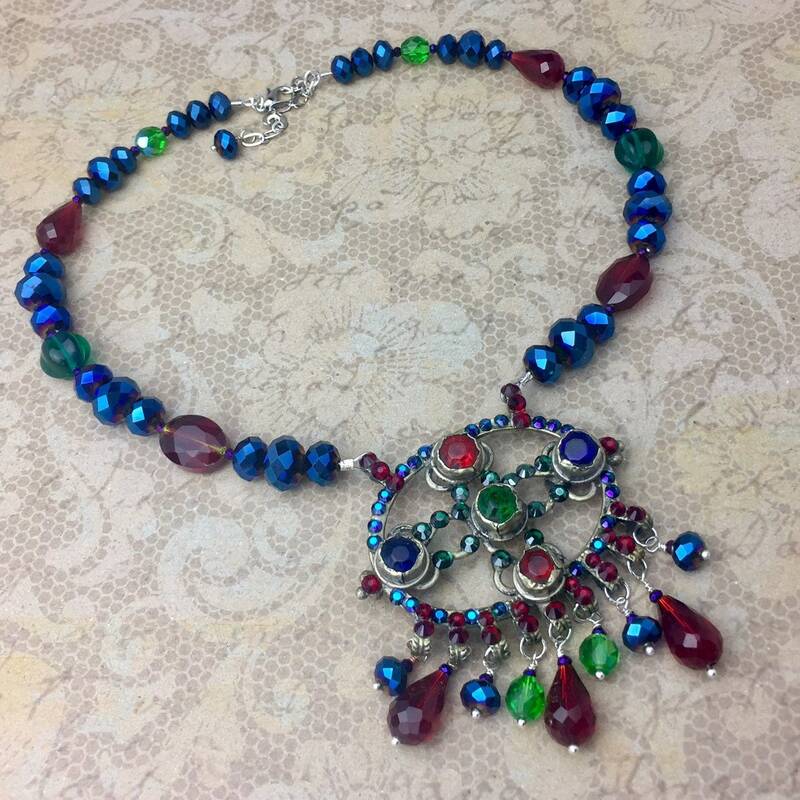 I added a strung necklace of chunky metallic blue, red and green glass beads. 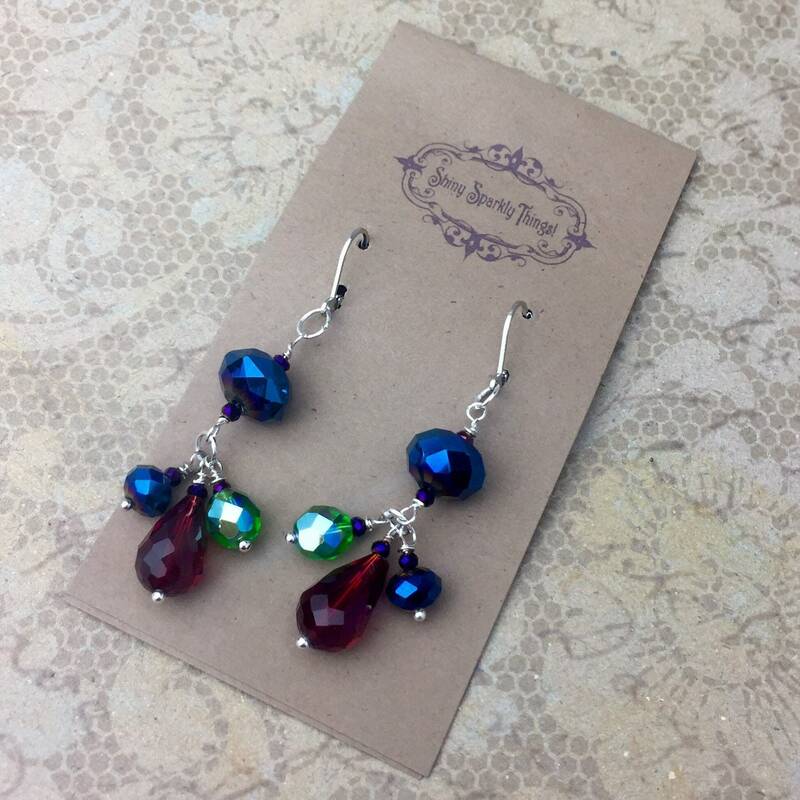 Earrings are 2 3/4" long with hinged earwires that are nickel free. Length is 17" + 2" extender. This cannot be shortened. Each one of my crystallized Kuchi pieces is a one of a kind creation. They start with swap-meet finds of vintage Kuchi pendants with their original glass gems. They are all absolutely unique and one of a kind. I LOVE seeing the wear on these and always wonder how many women have worn them and where in the world this particular piece has traveled. After spending some time with the piece and thinking about the original gems it has and it’s own unique coloring (many of these are worn silver color with a golden wash, so look gold in some light and silver in other), I start playing with beads and colors that will compliment the original intention of the piece. I also have a big ole stash of Kuchi bits and pieces that I use if they fit. I want to honor the intention of the original maker and only want to enhance and revive these pieces to be a little more modern, and most importantly (to me! ), sparkly! These vintage Kuchi pieces are of unknown metal content and are not expected to be hypoallergenic. If you have trouble with metal sensitivities, the piece could be lined with fabric or shielded with clear nail polish. Your necklace will be placed in a Shiny Sparkly Things gift box and carefully packed for shipment. Please report any shipping damage or problems within 7 days of receipt and we'll get you all taken care of. We are deeply committed to providing our customers with the same service we give our family and friends and want you to think of us when you think of great service (and beautiful, unique jewelry, too, of course)! Domestic US shipping is free on all purchases over $75, every day! Domestic US shipping is free on purchases over $75, everyday - if you have more than one item in your cart and it adds up to over $75, pm me for a coupon code for the free shipping, or I will refund the shipping charge.